The Arc tool creates an arc shape. For NEW performers, set the Red and Yellow Anchors on the Count Track to the count at which you wish the arc to be drawn. To transition EXISTING performers into an arc, move the Red Anchor to the count where the selected performers should “hit” the arc shape. Move the Yellow Anchor to the beginning count of the transition into the new arc. This is usually the previous set in the drill. Select the existing performers that will be moving into the arc using a Selection Tool. See the Drawing Tools overview for more explanation between new performers and transitioning existing performers. Clicking on the Arc tool will display the Arc Tool Control Panel. An arc is drawn by clicking three points on the field display. The first click on the field is the first endpoint of the arc. The second click on the field is the second endpoint of the arc. The third click on the field is a point along the edge of the arc. Entering a number in the Data Points box will change the number of points in the arc. This is useful to create different shapes. For example, 3 data points will create a wedge. 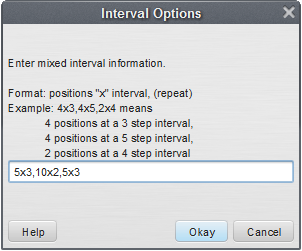 Similarly, entering the interval in the Interval box will lock the interval and the form will maintain the interval while you move its editing handles. Since the interval between positions is locked, the form would grow or shrink by changing the number of positions in the form. Many of the options in the Arc Tool Control Panel are exactly the same as options in the Line tool. 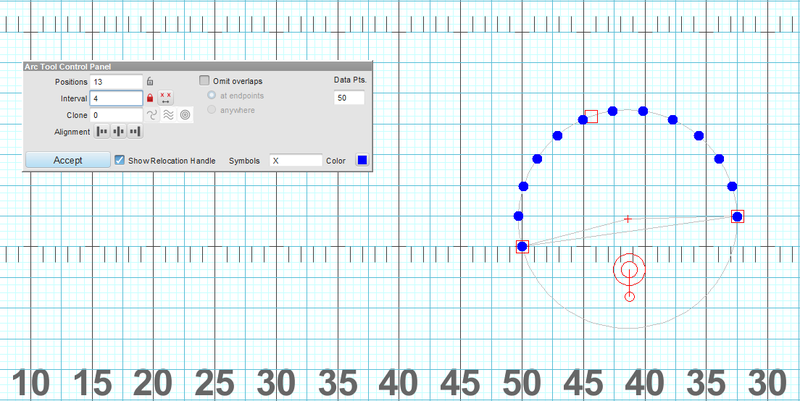 Refer to the Line tool for details on the Clone, Alignment, Symbol, Color, Editing Handles, and Reposition Handles. See Matching Lines for an explanation of the Matching Lines functions.